Are Private Vices Really Public Benefits? In my two previous postings I attempted to deflate a traditional philosophical notion of property by looking at some of the characteristics of the law of property. My presupposition in doing so was that property has as much claim to being a legal concept as a philosophical one. As far as I’m concerned, the same goes for the concept of contract, a claim I’ll explore in this and the next posting. Since the 17th century, the device of a social contract has been used by many philosophers, in both political and moral philosophy. In the former, it has been used to ground our obligation to obey political authority (e.g. Thomas Hobbes), or to ground a certain regime of political rights and freedoms, (e.g. 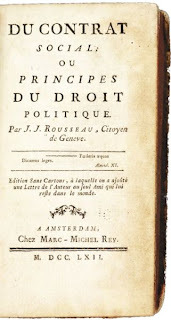 John Locke and Robert Nozick), or else to generate the fundamental principles of justice that ought to structure the basic institutions of a free and reasonable people (e.g. John Rawls). In the realm of moral philosophy, the contractarian approach has been used to test and sharpen our intuitions about what reasonable principles of morality would look like, as well as to justify the principles of morality. This notion that the device of a contract can be used to justify morality or political authority is particularly problematic. As Lord Shaftesbury wittily pointed out with regard to Hobbes’ version of the contract, “A Man is oblig'd to keep his Word. Why? Because he has given his Word to keep it. — Is not this a notable Account of the Original of moral Justice, and the Rise of Civil Government and Allegiance!” (Characteristicks of Men, Manners, Opinions, Times (1711), Vol. I, p. 110). In other words, in order for my promise to abide by the original social contract to be morally binding, some morality must already exist that will bind me to my promise. The very notion of a contract presupposes morality and cannot be the foundation of it. Shaftesbury was not the first to point this out. He likely got the argument from Richard Cumberland’s De Legibus Naturae (1672), e.g. ch. V, §56. Another philosophical problem with contract theory is this: depending on your initial assumptions regarding human nature and the corresponding state of nature, just about any moral or ethical theory can be generated from the machinery of contract theory. For example, if your state of nature is one of violence and misery resulting from a brutal and selfish human nature (I’m thinking of Hobbes here), then you would naturally drift towards a coercive and authoritarian theory robust enough to put an end to such a deplorable situation. On the other hand, if you generally think that human nature is redeemable and contains some “spark of better hope,” then your theory will tend to be one that emphasizes either representative or direct democracy and a minimal coercive role for government (e.g. John Locke). Furthermore, as Amartya Sen explores in his recent book, The Idea of Justice (Harvard University Press, 2009), there is a tendency for social contract theorists to become preoccupied with ideal justice in the institutions and social arrangements generated by their theories, while paying scant attention to real injustices that could plausibly be ameliorated here and now. This is the natural result of too much speculation about idealized human agents under idealized initial conditions. Such philosophers spend too much time theorizing about “spotless” justice (the term is Sen’s), instead of about how they could make the world more just than it is. The latter is perhaps less ambitious, but more realizable. Similarly, when philosophers employ the device of a social contract, they often do so in the context of finding the kind of ideal institutions that would embody their notion of an ideal justice. Unfortunately, they tend to have the unrealistic expectation that such institutions would be monolithic and unchanging — after all, if institutions are perfectly just, then why change them, right? But in the real world, circumstances inevitably change, necessitating institutional change as well. Finally, social contract theory is not descriptive, insofar as it does not accurately describe most people’s reasons for why they obey political authority, or why they think the exercise of such authority is legitimate. This point was well made by David Hume in his essay “Of the Original Contract” (1752). He there argued that, given a certain rough physical and mental equality between men (in the bare sense that any man is able through strength or guile or confederacy to kill any other), it was natural for men in their “rude state” to form an agreement to live together on certain terms “so clear and obvious that it might well be deemed superfluous to express them.” In other words, the original “contractors” knew the terms of whatever bargain they were striking, though they might be obscure to us, given the distance of time and circumstance and the lack of written documentation. Even on this minimal view, such “original contracts” were imperfectly realized and quickly lost in subsequent times by the conquest and usurpation of the powerful. In other words, in the real world, people feel themselves obliged to obey the sovereign power of their particular nation, and they do so (or at least did so, in Hume’s times) without rarefied notions that this was legitimated by consent expressed in some explicit contract. For Hume, political obligation was more akin to the duty owed to a parent than to another party to a contract. It was a relationship that did not have to be entered into by free consent, just as we all owe certain duties to parents, even though we didn’t enter voluntarily into that relationship. In fact, continues Hume, “almost all the governments which exist at present, or of which there remains any record in story, have been founded originally either on usurpation or conquest or both, without any pretense of a fair consent or voluntary subjection of the people.” And yet, at least for those of us lucky enough to live in one of the generally well-ordered democracies of the West, not only do we generally obey these governments, but we also believe that it is right to do so, and we further believe that everyone else ought to do the same. True, we may quibble with certain policies or actions of government, but obedience to political authority tout court is never fundamentally questioned by anyone who is not motivated by ignorance or self-interest, or deluded by the airy dreams of political philosophers. And we do not need the idea of an imaginary contract to tell us that this is the correct attitude to have.